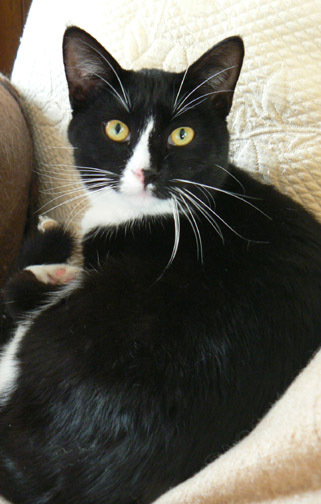 If you have a soft spot for felines of the Black & White, then Ms Tina is the girl for you. Her thin white streak up the the right side of her nose is so striking. Her sleek black back, her bright white tummy and paws, her gorgeous golden eyes!! And beyond her stunning looks, she is also so sweet and fun to be around. She was born the spring of 2011, and though still quite a kitten, she tends to me more of a mellow, easy-going girl.